SINCE Friday, things have been topsy-turvy. Our Section leader was away "en repos" and Glover, who is in charge in his absence, naturally feeling responsible for the safe-keeping of our many ambulances in this division of the army, thought best to evacuate Pont-à-Mousson. Of course the point of virtue in the idea was to avoid the possible loss of some of our men as well as cars --- which would be a tragedy for the French wounded. But our Section is here to give its best service and I can't help feeling that it is better not to lower the standard of work and efficiency by retiring to -----. Perhaps I have rather forcibly expressed this idea, but a number of the men here are of the same opinion. I sleep at Pont-à-Mousson as usual, and of course Schroeder does too, and now three others also. I want to point out that the moral effect of seeing us about this place is very great on the soldiers encamped here, and if you could have heard their condolences and seen the look of pleasure on their faces when Schroeder and I walked down the street last night, you would realize that what little extra risk it involves is negligible, compared to its beneficial effect. However, when Salisbury returns, we may have to leave, for good, dear old Pont-à-Mousson. I suppose you saw in the official French report of the 29th that we had been shelled --- it meant something to you then, I am sure --- but you little realized that it was our little group of ambulances they were hammering at. "American Ambulance Automobile, Section A.Y., composed of volunteers, friends of our country, has been continually conspicuous for the enthusiasm, courage, and zeal of all its members, who, regardless of danger, have worked without rest to save our wounded, whose affection and gratitude they have gained." Poor Mignot --- life at Pont-à-Mousson will be very different without him; and our mechanic, who was wounded, is, I now hear, to have his left arm amputated. [NOTE: He died soon after.] What a real tragedy the 22d was for us! The more we think about the evening, and as further details come to light, the more we marvel that we were not all killed. It is strange, too, how those who one felt would behave well --- did --and I am proud of my friends in the Section. P.S. We hear that a German captain, a prisoner in Paris, said that if any American ambulance man was captured prisoner he would be shot! Nice lot of people! are n't they? I had a very interesting day yesterday; as you will have seen by official reports, the Germans presented us again with some twenty to thirty big shells on Monday night, and although I was at Pont-à-Mousson, I was in a good cellar! About three people were killed, but one woman was wounded, just down the road, and the doctor and I had to run out and bring her in. We were sufficiently excited not to think of more shells, and as she could run too --- and did so with a vengeance --- it was not a long "promenade"! Fig. 15. The snapshot of a German first line trench from a French advance post. Yesterday, I went with Schroeder to lunch with the battery who had entertained us at dinner on the 14th July. They had moved their position nearer the Germans. I have rarely enjoyed a day more --- the sun was glorious --- the views perfect ---and the woods enchanting --- though shells bursting in the air took the place of birds! We had a splendid lunch, and afterwards went out and visited the numerous guns and trenches. I took many wonderful photos (c'est à dire they ought to be), I saw about five different-sized guns, and then we advanced to the trenches. Finally we reached the first line, where silence reigned supreme except for the occasional bang of a rifle or the intermittent explosion of shells. We went to an advanced post (several metres in front of first line), and there carefully looking through a hole I saw the German trenches. I then expressed a wish to be able to photo them, and I was shown a place where I could stand up and quickly get a snapshot. I regretted having made the wish, but I saw they were looking at me, and I did n't intend showing a white liver, so up I jumped and took two. The bullets did not whistle all around me, as I suppose I ought to write, and although I was successful in taking the picture I do not intend to try the game again. In fact, I have now seen all the trench life I want to --- and do not mean to visit them further. The point is that if I should be killed or wounded on a sight-seeing expedition it would not be very creditable, and we run quite enough risk when on duty. Strange to say, I felt far less nervous in the first-line trenches than when on service at Pont-à-Mousson or Montauville --- in fact I felt quite a sense of security in those splendidly built trenches, while in a town the shelling is so much more dangerous; and when you have to go out into it sitting on that little Ford jostling its way over the bumpy road, the sensation is not a very comfortable one. However, as I told you before, I am a fatalist now --- absolutely. We made our way slowly home to Pont-à-Mousson and there saw shells bursting over a little town in the valley and I got a photo of it. I am tired, so good-night. All your letters from July 4th to July 15th have just arrived, and also a very nice one from Marconi. It was a great joy to me to know of your success and of your glorious effort. Things are gradually quieting down here, but we have had a dreadful time. However, I am glad the work we are doing is so well worth the cost. One has little time and less inclination, in the presence of such great tragedy, to consider the virtue of one's personal service, but somehow it is good to remember that, although one has done work at the front, it was without pay, titles, etc. --- I acknowledge that I look forward to October when I plan to go back for a bit. I shall have had four months' service at the front, without a rest, and although I can, I hope, keep going another eight or ten weeks, I feel that without some respite the winter would finish me, if the Germans omitted to do so. I find myself feeling an intense --- though futile and unphilosophic --- resentment at my physical condition: the not being able to eat enough to keep always at top speed --- and of course one can never allow even a shadow, much less a mention of one's own problems to appear. The personal equation practically does n't exist here. Salisbury, who has returned to us, has supported our little group, who objected to the evacuation of Pont-à-Mousson. He found us a very fine, suitable house (an aesthete would go mad in it --- German, and bad German at that), and we were told that no shell had fallen near it for nine months, so we entered with confidence. The telephone was established, and after changing the furniture about, altering a few details, and (I confess it) bringing in a few flowers from the garden, we found ourselves almost magnificently installed. 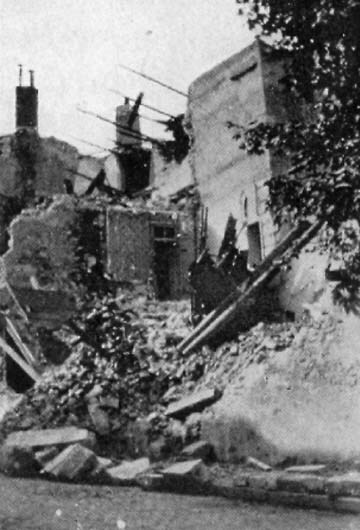 Yesterday, the 1st of August, the French violently bombarded a town where a German regiment was en repos, and when I arrived at Montauville for day duty at seven-thirty yesterday morning, I was told that all the towns around here were expecting a bombardment in revenge. Needless to say, it was correct. About ten o'clock I had a call to go to Auberge St. Pierre for two seriously wounded, and when I arrived there, the médecin chef told me that if I got them to the hospital quickly, they would have a chance of living. So "No. 10" tooted off down the hill --- at what the plain warrior would term --"a hell of a pace." As I entered Montauville I saw no one about, but as I passed a poste de secour, a doctor rushed out and told me to take two more if I had room. I noticed they filled my car with extraordinary speed, and it was not necessary to tell me that Montauville was being bombarded. My stretchers filled, I set off again for my destination with the four seriously wounded. I decided to take a different road, which was quicker, though supposed to be more dangerous, and two big shells fell on the road I did not take while I passed. I began to think myself lucky. 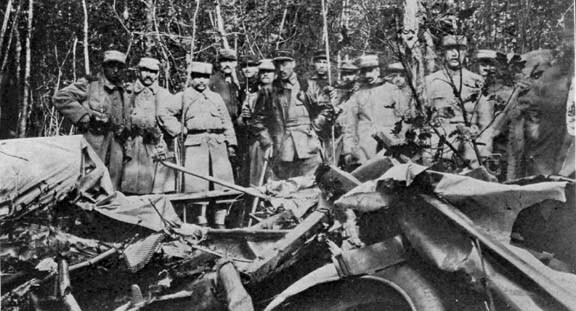 As I entered Pont-à-Mousson, I saw no one about (a bad sign), and on turning to go to Dieulouard where we take the wounded I saw a huge shell explode two hundred metres down the road I was to drive along. Had the ambulance been empty, or with only slightly wounded, I should have waited, of course, but under the circumstances my duty was to go on as fast as I could. I noticed ahead of me three large motor-trucks and the thought struck me: "What if those are hit and contain ammunition." I was ten yards away when --- bang! --- I was half blown out of my seat --- a shell had landed on the motor-truck. Hardly believing I was not hit, I increased my pace and emerged from the smoke and blackness, going at a good clip, safe and sound, but shaken. I deposited my wounded and started to return, but was stopped and told that the road was not passable as thirty large "210's" had fallen on it and trees were all over the place. I forgot to mention the truly gruesome part of the tale --- when I arrived at Dieulouard, I noticed that everybody was pointing at my car. I supposed it was because we looked so smoke-grimed; but on arrival at the hospital, several people ran out to me with curious expressions, and I then got down to discover what was troubling them. One of the poor fellows had thrown himself off the stretcher and all of his bandages had slipped and a trail of red was flowing from the car and leaving a pool on the ground. I got back to our Bureau about twelve o'clock by a roundabout way, and had lunch and went up about twelve-thirty to Montauville again. While at lunch the shells continued to fall at fairly regular intervals on the road. Suddenly those nearest the window threw themselves on the floor (an action familiar to us constantly under shell fire), and before you could sneeze, the lot of us did likewise, and we heard an éclat fly over the house. Laughing, we got up --- we were about eight hundred metres from where the shells were bursting --- and I went out into the street to see where the éclat had fallen. There it was on the road, weighing about three and a half pounds --- it was hot to the touch---three and a half pounds thrown eight hundred metres. I have kept it as a paper-weight ---as a little luncheon incident it is entertaining. Nothing of great interest happened during the afternoon, except that I broke my foot-brake and to-morrow must put in a new one. After dinner, being off duty, I went to bed about eight o'clock. Schroeder left yesterday to go and see his brother who is wounded --- he returns in about a week. Meanwhile, I am alone and don't like it. At one-thirty o'clock this morning I woke up. Something was wrong. Bang! Bang! Bang! Bang! Pont-à-Mousson being bombarded, and badly --- fifteen shells falling in three minutes, I counted, and the firing continued for an hour and a half with intervals. I got dressed --- prepared to descend into the cellar if the shells came too near my house, and then about six-fifteen the bombardment stopped. I left the house to find several fires started around the town --- they had shelled with incendiary shells as well as high explosives. As I got back to our new headquarters, imagine my surprise to find a huge shell hole --- two yards from the house --- in the drive itself --- the house never bombarded for nine months. All the fellows, however, were safe, and our breakfast was a jocular one, for we could not help seeing the funny side of it all. Just a few more lines, as one of our Section is returning to America and will take these letters over, and you should get them about August 18th, with luck. I hope the lecture was a financial success besides a personal one! If all those people in America only knew what this Section and our work mean to the soldiers here, money would not be long in coming. No one can realize what our little group does for the mutilated wounded --- but if any one doubts it, I wish he or she could see the grateful thanks in the eyes of the wounded soldier as he is taken from our ambulance and put into a fairly comfortable bed, with doctors ready to attend him. Let him see the poor soldier, hardly able to move, insist on taking your hand, and let him hear that whispered "Merci, mon camarade " --let him talk to the soldiers newly returned from the trenches or just about to enter there ---let him hear that smiling greeting and see those hands waving, "Bon jour, camarade" --- let him hear what the officers say --- then, if he has had any doubts he could have them no longer. I don't claim that I personally am doing anything, but I do say that this Section of twenty-five men has done more to cement the love for America with the troops around here than any possible action the U.S.A. could take in this war, and I believe that the same fact is true of our Service in the north and south fronts. Every one should realize this, and I hope that any of my friends to whom you read this letter will bear our Field Service in mind if they hear of any one wishing to be truly philanthropic. The hospital itself cannot go on indefinitely supporting us, as they are very short of funds, and have a great undertaking on hand to feed and keep up the Neuilly and Juilly Hospitals --- "Doc" tells me they must get two million francs to keep things going till next spring. Only a small portion of that money, of course, could come to our Field Service, so your effort is for a great Purpose. I must tell you what happened to the wounded before our little cars came here --- we carried over eighteen hundred last week and more than seventy-five hundred during July. They were picked up in the trenches (Bois-le-Prêtre, etc.) when they could be got at ---sometimes, if lucky, an hour after, and sometimes five or six hours --- or never. The brancardiers (chiefly artists before the war!) do this work --- a terrible job, and very, very dangerous, as the wounded are often between the German and French trenches and they have to creep out at night and drag them in. Well, these wounded are carried on brancards (stretchers) down the hill from the trenches --- probably a journey of some thirty minutes to the "refuge des blessés (still in the wood), and there a primitive dressing, to stop bleeding, is put on. Then they are jostled on --- on --- on --- till they arrive at one of the postes de secour, where our light little cars can go --- these are at Auberge St. Pierre, Clos-Bois, and Montauville. Here in former days they were re-dressed, and if there were room, stayed in the little shelter, or if not, they had to lie outside till a horse-wagon came to fetch them. Sometimes they would have to wait many hours before their turn came, and even the most urgent cases would not get away and arrive at the hospital for a long time. Hundreds of soldiers died thus. Now, with our little cars, an urgent case is at the hospital ready for operation in twenty minutes at the most and generally about ten to fifteen ---no matter what time of the day or night. That is why these soldiers around here are so grateful. I have seen cars go up to Auberge St. Pierre to fetch an urgent case when the driver knew the road was being shelled, and the soldiers who see our cars tooting up the hill, wonder ---and say, " Volontaires? " I have got a call and so must stop --- for before I could get back the friend who is to take this letter would doubtless have had to leave. I still have a few minutes, so I will continue. As you know, I almost never reread what I write, but I have run over this letter, and although every word I say is accurate and unexaggerated, I don't want you to imagine that the French Red Cross is not efficient --- but they cannot afford cars everywhere with drivers, etc. ; that is why our Section here is so useful. The horror of the whole war is growing on me day by day, and sometimes when I have got into my bed or am trying to get a few hours' sleep on a stretcher (every other night I am on duty and so cannot undress), the horrors of blood --- broken arms, mutilated trunks, and ripped-open faces, etc. --- haunt me, and I feel I can hardly go through another day of it. But all that is soon forgotten when a call comes, and you see those bandaged soldiers waiting to be taken to a hospital. I almost love my old car --- it was in the battle of the Marne ---and I often find myself talking to it as I pick my way in pitch darkness --- past carriage guns or reinforcements. If one does not quickly become an expert driver, one would have no car to drive, for it is almost impossible to see five yards ahead, and it is at night that the roads are full of horse-carts and soldiers. "You just have letters? " "Yes --- not even opened yet." "All those! You are to be married, perhaps?" "Surely it is your mother, then, who has written so often." "Only this one is from her," I answered. And then a strange silence fell --- I did not feel like speaking, for glancing up, I realized that he was still looking at that one letter in my hand. After a few moments, fumbling in his uniform, he pulled out a packet of earth-stained letters. " These were from my mother --- but I can no longer look for them---she died last month.". Perhaps it was that little incident that made me appreciate so tremendously these messages from home, but when I got into bed last night and lit a candle by my side to re-read them all, --- and when my mother's turn came, --- I found the link with that boy and realized how much he has lost and how he must treasure and find comfort in that little batch of memories in his pocket. They too were probably full of anxiety for his welfare, full of encouragement and confidence in his doing his duty as a true French woman's son. And then my imagination wandered to another side: --The letters from the front --- the letters of assurance --- of counsel not to worry --- and next, perhaps, the citation --- for gallantry --- the pride and happiness of those at home. --- Finally that most dreaded letter --- or the brief announcement in the list of those "Mort au Champ d'Honneur." Are we really living in the twentieth century after 1900 years of teaching of supposed civilization and Christianity? The day before yesterday, after having made several trips with wounded, I had a pressing call to Auberge St. Pierre. There the Germans were bombarding as usual, and it was unpleasant. A shell had landed near a kitchen, killing several and seriously wounding one soldier. He had a hole as big as your fist right through his back. " There is a chance if you can get him to the operating-room quickly," I was told ---it was eighteen kilometres to the best surgeon; so off dear old "No. 10" and I started on our rush for life. Toot ! toot ! toot I --- and even the soldiers, realizing that I had a man's life in my care, made a clear way in the road ahead --- and through village after village, without moving the throttle, we sped on and on. Bump, bump, bump, --- what did it matter if I had to shake him about a little,---he was unconscious, and every second counted. "I hope I won't have a puncture," I found myself muttering from time to time. Finally, I turned to the left --- then another corner, --- and blowing my horn I drew up at the tent. In a second two brancardiers had the car unloaded --- the surgeon in white was washing his hands --- and thirty minutes from the time my charge was given into my care, he was lying on the operating-table. "He may live," said the surgeon. That was my reward! That is why I am happy, even here, --- only for this reason, --- one sometimes saves lives and never intentionally kills. The other day I went up to the top of Mousson --- i.e., the hill the other side of the bridge. It is under another army division, and so we have to get special permission from the Colonel, but as our Section is treated so wonderfully there is no difficulty in procuring it. We first stopped at the graveyard and tried to find poor Mignot's grave, but in that mess of débris, --- overturned sepulchres --- upheaved tombstones --- burst-open coffins --- sun-bleached bones --- and the hundred new-made graves, ---we could not find it. We would have continued our search, but an officer told us not to stay any longer, as we were in easy view of the Germans and they might bombard at any moment. We started to go to the summit. Up the hill we climbed and the little mountain-side was all pitted with shell holes,----some of them most discomfortingly new. At last we reached the top and began to look about. A few minutes after, having asked a soldier some question, we found ourselves surrounded, and rather roughly asked for our pass. We showed it with the Colonel's signature, and then followed a hearty laugh --- when they had to confess they thought our foreign accent was Boche! We asked in what direction Metz was, and there just over the hill, to the right of a little tree we stood facing, it lay, and, like some glorious dominating giant, stood out the cathedral --- built by the French for the worship of God and teaching of Christianity, and now so kept by the Germans! ---the race which has set loose the scourge. If I could only be in the procession that marches in triumph to Metz! I must tell you just one more incident. The other evening I was walking down the street when an excited shout made me stop and I saw running toward me an old friend --- one I knew when I was in London ---now dressed in the blue of France. "What on earth are you doing here? " I asked. "Tell me how in the name of all that's possible, did you get out to the front," he replied, and then we set to and talked. He is a French artist who lived in London and entered the French army, as the English would not have him. He, knowing I had not passed the "military medical," could not get over the fact that I had arrived here notwithstanding. He dragged me to a group of his friends and we all had a happy half-hour. Then the usual handshake and au revoir. As I turned away, he followed me: --- "I go to Quart-en-Réserve tonight for some days ---probably I shall not return whole. If I am a bit knocked out you will know, and if I am killed, my people will know. It would be hard for my wife wondering whether I was seriously hurt or not --- she is about to have a child. Supposing I am wounded, will you post this letter --- it only says that I am getting on well --- am but slightly wounded and that she is not to worry." I add no comment to the story, but I do wish you could realize what trench life means to the infantry when they know they have to go to a hell like the Quart-en-Réserve. I know what I feel like when I have to drive along a road being bombarded by the Germans ---but that is only for five or six minutes --- but think of five or six days with scarcely an hour's rest out of the twenty-four. No wonder we have to carry madmen to the hospital sometimes. Fig. 19. View of Moselle behind my house. Poor old "No. 10" has been ill, so I have had her engine down and cleaned it. Now she is running finely. There is an American stationed here who enlisted in the French army --- poor boy, he is only twenty. We asked him to dinner.
" Well, I guess I wanted to see some action." " Satisfied? Well, I came here to see life and movement --- all I see in my ditch are worms, spiders, marmites, and torpilles! " "So you have changed your mind? " "No ---guess my mind is the same as when I enlisted --- I wanted to see war --- I still do. I have n't seen war --- I have seen murder and cultivated, systematic butchery." There has been a lot of "permission" for the soldiers here and they are now returning after their eight days --- the first eight days in twelve months, the first time they have seen their wives and mothers for a year, and in many cases they have their first look at their own children born in their absence. One soldier I asked whether his wife was pleased to see him: --- "Ah," he said, "you should have seen her cry when I left." "But when you arrived?" I asked. "She was pleased! Ah, mon Dieu, you should have seen her cry when I arrived." To-day has been a villainous one. The French bombarded the German stores, and set fire to some large storage-place ---we think petrol and stores (perhaps the petrol they spray lighted into our trenches), and from twelve o'clock till now the whole sky has been black with smoke. Of course the Germans made "reprisals" and every little town around was bombarded. One shell which burst where nine persons were sitting dining killed them all. The telephone bell rings --- two cars wanted at once for L-----. About 10.45 this morning a German aeroplane came over the town --- not two hundred and fifty metres high. We could see the pilot and observer and the four Maltese crosses on the planes. It was one of the bravest acts I have seen. She was too low for the artillery to open up fire, so the soldiers fired at her with their rifles, and although it seemed as if she must have been hit, the pilot turned around and flew safely back to the German lines. This little incident leaves us with a very uneasy feeling, as we think no German would have taken such risk unless the mission had been very important. He must have seen everything he wanted to --- our cars are fairly conspicuous with their crosses on the top of the canvas. He dropped signals as he flew over our house ---and we are wondering just what is to follow --- and when! 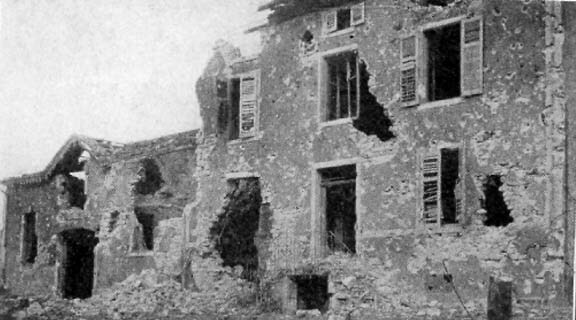 The Germans, not satisfied with the reprisals they took on the 22d for the burning by the French of store and factory at Pagny, again opened up on certain buildings of a neighboring town on August 22. They sent over 150 shells between two o'clock and seven. All large marmites ---210's, 280's, and I believe some larger. The damage done is considerable, but after such a bombardment it was marvelous that anything remained. Over thirty-three shells-fell in the road! It happened to be my day of repos and I was asked if I would care to go to Nancy for the day, so at seven o'clock in the morning I appeared in full parade uniform, so to speak; and except that I had n't the heart to shave off my temporary mustache, I am sure I must have cut quite a figure! Off we went to Nancy and spent an interesting day looking all over that wonderful town. Salisbury as you know has got the croix-de-guerre, and we all felt very proud parading the street with him, and his significant ribbon. While the two men with me went to have a hair-cut, which I happened to feel no impulse to do, I stayed outside in the car. I noticed four Moroccans walking down the street, and casually thought how picturesque their red fezes looked against their blue uniform, when to my horror they stopped by my car and started saluting and bowing and talking so ostentatiously that it took exactly thirty seconds for a large crowd of Nancy inhabitants to collect. The mere fact of being in town for the first time in twelve weeks was quite strange, but to find myself surrounded by a quantity of civilians and the center of attraction was, to say the least, most embarrassing. It was a hot day, and I felt the perspiration pouring down my back, as I looked to right and left for a way of escape. But my trial was not over. Horrors! My hand was taken and all four soldiers solemnly bowed over it and kissed it. I did not know what to do --- being anxious not to offend them, nor to add to the amusement of the onlooking civilians. I thanked them in the name of America, for the honor they were paying her I and brought down on my unsuspecting hand a renewal of the embrace. Suddenly --- joy! what was that? An Irish voice I "Sure, young man, it's an uncomfortable soul ye are this minute." And an old fellow emerged from the multitude bristling with the hope of a brawl. However, he calmly joined forces with me ---and we presently left the crowd with as much dignity as was possible under the circumstances. From him I heard all about the war, and as much, if not more, about Ireland, as we sat in a public house across the street. So ended an awkward encounter. Well, we left Nancy about five-thirty (I had bought cakes and various luxuries for the boys), and when we arrived just outside R-----, about six-thirty, we saw to our surprise the effects of the bombardment on buildings and the road. Uncertain whether to take a chance or not, we drove nearer and were still hesitating when a shell burst a hundred yards down the road, and decided us! Not being on duty we had no reason to go to Pont-à-Mousson, so turning around we went to dinner at Toul. After a good meal we started home and arriving at my room at eleven-thirty I was relieved to hear that no one had been injured. Several big éclats, however, had fallen in our garden and two of our cars had very narrow escapes. A strange thing to me was the sense of dissatisfaction--- of subconscious restlessness ---I felt while in Nancy. It was the first time for twelve weeks I had been in a civilized town, where everything was going on as usual. It all seemed so artificial , so futile and aimless. As our car tooted home, I turned around and exclaimed: --- "Oh, Lord! how glad I am to get back again to our dear old peaceful bit of country!" --- rather Irish but quite sincere. The other day I had two hours off duty and McConnell and I went for a walk along the Moselle. We saw several soldiers bathing and decided it would be a good idea to do likewise. It was a gloriously hot day, so the fact that we had no towels was unimportant. I confess I became"anglais " to the extent of insisting on walking along the bank until we got away from every one and could bathe alone. At last we found a quiet corner and started to undress --- but we had been noticed! "C'est les Américains" ---and before we could realize it, some soldiers were hurriedly preparing to swim in the Moselle with us, so our bath became a real party. I only tell this little incident to show again how ready the soldiers always are to join and talk to members of our little Section. 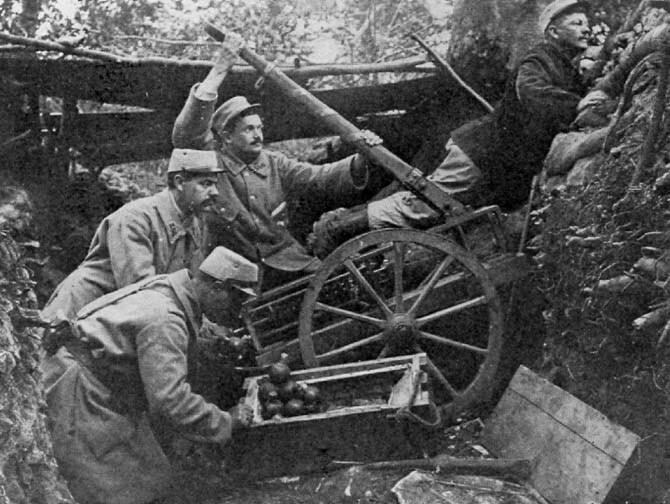 A sad thing happened the other day to a friend of mine, a poilu who has been helping me to get specimens of perfect, empty German shells (those which have "arrived," but not exploded). The fellow was an expert at dismounting them, --- a very dangerous task, --- and when he had entirely emptied them, used to bring them to me. I had many a long talk with him, and he got quite fond of American tobacco (poilus don't usually care for "'eenglish" tobacco). He used to like to tell me about his girl, and how happy they were together before the war --- and how the day peace was declared, he was going to marry her. Lately I had noticed he looked depressed, and one day I found out the reason. I was in his little cellar sitting on a block of wood, talking of America, and he of France, when the postman came to the door. He looked at my friend ---who had become alert --- and shaking his head, said, "Pas encore" ---and murmuring "Salut" to me continued his walk with his precious "letters from home." My friend became very white --- and presently confessed to me that he had had no letters for six weeks. Forty-two days --- that seems a terribly long time out here, you know. A few days after, I saw him again and asked if he had heard from his girl. He said "no," very sullenly, but later, over a glass of beer, he mentioned that his father had written to say his girl had been misbehaving herself. The poor fellow seemed stunned with the news. After vainly trying to cheer him up, I went back to dinner. The next morning I did not see him, being on Montauville duty, but the following morning I was at headquarters when an urgent call came for an ambulance. My car happened to be just going, so I took the trip. "Where was the house?" I asked. "Just over there where the man is waving." It was the house of my friend. Need I end the story? A broken man, who had worked valiantly for twelve months under hellish conditions to defend his country---had shot himself. We lifted him on to a stretcher---then, feeling pretty badly, and with the doctor's urgent warning against loss of time ringing in my ears, we, "No. 10 " and I, sped away to B-----. They took him out of my car --- read the little pink fiche which is attached to every wounded soldier and filled in by the doctor, who has dressed him in the first "poste de secour " --- and then exchanged glances. I knew those glances not only meant that life was nearly extinct, but that it did not much matter whether he recovered or not --- as he would get six years' imprisonment if he got well, for attempted suicide, and that sentence, in war-time, means constant first-line trench work. I followed him into the operating-room, where he opened his eyes, and I think he recognized me --- his lips moved --- but I don't know. The other night came a hurried call to Clos Bois for a poor fellow who had kept his grenade too long and was very badly shattered. "Just a chance if you get him to the Hospital quickly," said the doctor. How many times I have felt quite elated at this injunction, and literally flown to the Belleville Hospital; but in this instance I had that horrible sense of hopelessness. It was dark and quite impossible to make Belleville under an hour and a quarter. The poor fellow died before I could get there. To-day, I took all the carbon out of the car and put in a new commutator. A quiet and lonely day. I feel homesick. The German offensive which I thought might take place yesterday did not. The French got news of the fact and of the hour that they proposed to attack , and five minutes beforehand the "75's " opened up and catching many of the Germans already in their first line of trenches so demoralized them as to wholly disrupt their intention. We had only about ten wounded, but goodness knows how many they lost. I forgot to mention a very important event in the history of the Section. After the Blenod attack Walter and I went to see the damage done. We found the havoc was pretty bad. We were talking to some men who had actually been in a room where a shell exploded and had not even been wounded, when a soldier joined us and speaking in good English, asked if we would like to have some English papers. Although we felt pretty sure they wouldn't contain very recent news, we had to show an eager appreciation and asked him if he would go and fetch them. We followed him to his lodging. He presently emerged with a large parcel of quite old papers and began chatting with us. London was mentioned and we soon discovered that he had been chef for some friends of mine and had after leaving them become chef to Lord Fisher. I think I told you that our chef was an undertaker before the war, and his cooking was such that we wonder he did not achieve a lot of patrons in our Section. When we got back to the Bureau we decided to ask the Governor of Pont-à-Mousson to allow us to have Cosson --- for that was his name --- as our chef, and of course our request was immediately acceded to; so now we are having food de luxe, and the singe (as they call the American tinned meat we have to eat every other meal) was quite delicious as a curry last night! I hope I have not missed to-day's mail. I may have done so, as I hear our letters are kept for some time before being forwarded. In case I have, it will be September 27th or so before you get this, and I shall perhaps have started home on leave; though as the time approaches for me to go, I doubt more and more whether I can actually break away! The only possibility of real contentment now for any one who cares for France or England is to stay until their just cause is victorious ---or (as in many a case, alas!) until the call to eternal peace. Every soldier is dreading the winter here and secretly fosters the almost hopeless wish and belief that there will be no winter campaign. However, as day passes day, and all preparations for one go forward to completion, the French, with their wonderful pluck and determination, will resign themselves to the inevitable. The other day a poilu who was standing as usual with eight or nine others around my car at X-----, suddenly expressed this compensating thought: "Well, it may be hard for us French this side of Europe, but what a time the Boches will have in Russia!" ---and the idea quite cheered up the little party. Yesterday I had a sudden call to fetch three badly wounded. One of them was in great pain from a wound in the back, and the slightest jostle or bump I knew would cause him great agony. The doctor, pointing to one of the other two, said, "You must get him to the operating-room as quickly as you can." "But," I answered, " I dare not go fast, this poor chap is in such condition." The doctor shrugged his shoulders---but the man who was suffering had heard --- "Go as fast as you can, my friend, it won't kill me! " I did so --- and the bumps were bad. The poor fellow could not help uttering cries from time to time. Before I arrived at Belleville, the cries had ceased, as the great pain had made him unconscious. The badly wounded man was dead. "C'est la guerre," said the doctor to whom I told the story --- and I left him washing his hands for the operation. I have just heard an amusing fragment. A German prisoner lately taken, was seated in the telephone office at Montauville, waiting to be transported. He had stamped on his uniform buttons an iron cross, and the French were asking him why he wore it. He explained that it was the right of a Section who had earned the iron cross to do so. The Frenchmen started chaffing him. He could understand and speak French, and a jocular remark not particularly complimentary to the Kaiser was cut short by the prisoner, who, nervously looking round the room, said in an awed whisper, "Oh! if the Kaiser should hear of your talking this way --- mein Gott! " The other day I paid a visit to the hospital at L-----, and found all the wounded (only very serious cases stay here) quite happy and buoyant, and the men who had been evacuated in my car never failed to remind me --- and thank me. One young fellow about my own age had had his left leg amputated. I sat by his bed and chatted with him, and he told me of his wife --- a year and a half married--- and of his child whom he had not yet seen. He was so very eager that somehow the pity of it made me turn aside for a second, and look out the window. Quick of perception, out went his hand to mine --- "Oh, she will understand, camarade," he said, smiling; "she will love me just the same --- she is a Frenchwoman." How can one help caring for France and French people --- they have such keen appreciation of the value of sympathy and gratitude. Here in the midst of torturing death, they at least are cheerful, and, having put aside the barrier of selfishness are wholly simple and direct in their human relations. The fact that on every side there is daily evidence of this attitude --- in spite of so bitter and costly a struggle --- is high proof of the fineness of their civilization. To-day the Section and our Section leader were decorated. The ceremony took place in the garden and the "Croix de Guerre " was pinned on Salisbury's breast. The double kiss, given with dignity, and a few words of congratulation to our Section by the médecin divisionnaire ended the notable event. So we now have hanging over our mantelpiece this coveted insignia. The Section is not going to move from here. The General says it is one of the most active parts on the line, and lately, although the wounded have not been so very numerous, the trench bombardments have been so heavy that I anticipate more action. Did I tell you of the marvellous escape George Roeder and Walter Lovell had yesterday? A shell dropped eight or ten yards away from them in the road and did not explode. I wonder they did n't die of surprise! I don't know what our Section would have done without those two. But everything happens to George and he still has a whole skin, thank God! No letter from America has come to me for over two weeks, which is not very stimulating. Out here, mole hills are mountains, and mountains --- impassable, and although it is of no real importance whether one gets a letter or not, or whether the letter one may get is cold or warm, yet these small and seemingly insignificant things are sometimes enough to send away sleep. I suppose the truth is, I really need a rest and change. It has seemed to me lately that modern warfare means even more of a nervous expenditure than a physical one. The nights are getting cold, dark and damp. The leaves are falling, underbrush turning --- the icy hand of winter stretches out nearer and nearer ---and the trials of the poilus are doubling every day. Yesterday I talked with a priest. He and most of his calling voluntarily accepted at the beginning of the war the fearful task of burying the dead. It sounds very simple, does n't it? Do You realize what it means? It means handling terrible objects covered with blood-soaked clothing, that once had the shape of human beings. It means taking from these forms all articles of apparel that might prove serviceable and searching through these red-stained clothes for any letters or identification. Some of these shapes are hardly of human outline, very stiff and cold. Some are mere fragments, no longer of any recognizable form. That is a little of what burying the dead means. I spare you more detail. And this is the work the priests of Peace are doing in France. Wonderful, you think? No, it is French temperament, French courage. The musician is now brancardier. The artist, the poet, the paterfamilias of age past military obligation --- all digging trenches --- or any work they can lay their hands upon. That is why France lives and has lived through all her agony. How often have we heard said "Poor France! She will never stand this great calamity!" She will stand a hundred such calamities and always come to the top again! And for a Sunday, quite quiet. Of course we had our usual bombardment, but only shrapnel. About 4.30, they started to arrive and a call for two cars followed. I had to go to M----- and on the way up there, at the X----- I saw a horrible sight, two dead, three wounded --- and a horse. A shrapnel shell, badly timed, had fallen exactly in the middle of the road and made a great mess. Schroeder and Willis were there, so I continued up to M-----, where I got seven wounded. The American mail has arrived! Letters from you, Joe, and S-----. A feast! Serious bombardment of three villages. Schroeder and I were at Dieulouard, so for the first time missed it. It was a pleasant miss for us. Those who pretend they like to be in bombardments are either humbugs or have never been in a real one. Having experienced them more or less for four months, I dislike the sensation now as much as on my first day. . It is an interesting fact that while the villages about here are under constant bombardment many of the oldest civilians cannot be induced to leave their homes, preferring to risk death in their cellars. The other day a very old woman at Montauville had an amazing escape. A "150 " high-explosive shell fell into the bedroom of a cottage where she was sleeping. The small room was entirely shattered, but its occupant was not even injured! When I saw her soon after she was in an intense state of resentment over the destruction of her personal belongings, but her own escape did not seem to appeal to her. Early one morning a soldier appeared in a boyau (communication trench) near here in the uniform of a génie (French engineer) and started chatting with some passing poilus. He told them he was inspecting the lines and they showed him round their trenches. On his tour, so to speak, he met some artillerymen, who asked him to lunch with their battery. He accepted, and after lunch wandered about the wood with his new-found friends, who showed him the position of many guns. As night came on, explaining he had to return to duty, he left his friends and went to the trenches. It was now dark and on getting to the first line, he told the sentry that he had orders to go out and inspect the barbed wire between the lines. As that was in accordance with the duties of a génie, the sentry let him go. The man never returned, and as, on inquiry, the company to which he said he belonged did not know him, there is little doubt he was a German spy. Another story I heard from a friend of mine in the trenches near Soissons, and it is typical of the hopeless brutality we have to expect. When the trenches are very close to each other, a little advance post is dug so that one can hear what is being said by the enemy in their trenches. Generally, however, the distance between the lines is too great for this, and at night a soldier is sent out to crawl to within hearing distance of the enemy. One night a poilu so engaged got wounded and when daylight came he was seen to be struggling to crawl back to his friends. Two soldiers promptly started out to help him, but on reaching him the Germans shot and wounded them, so that the three men were now crying to their comrades to come and save them. Realizing that it was death to any one who left the trench in daylight, the captain forbade more of his men to venture out before dark. As soon as darkness fell, two other soldiers crept forth, but no sooner had they reached the three wounded than an illuminating rocket disclosed their positions to the enemy, and left five men lying wounded between the lines. As the captain could not afford to lose his men in this futile way, he detailed two sentries to shoot any one attempting to leave. The five men lay there shouting to their friends --- calling them by their names --- reminding them of their friendship --- and asking if they were going to allow their comrades to die thus without help. So that when two brancardiers came into the trench they found the occupants in a terrible state of anguish and nerve tension. Not being under the command of the captain, and being Red Cross, they promptly left the trench to save the five wounded Frenchmen --- Seven men are still there between friend and foe, --- but at peace now, God willing. On Tuesday, Ben and Willis and I went to Nomeny, a town some fifteen kilometres away, the other side of the Moselle. It was a long walk. After stopping to put a wreath on Mignot's grave, we started about one o'clock on our journey. It was a very hot day! We arrived at a little village which at first sight looked deserted. We soon saw the reason. In the middle of the road was a large hole, a little farther on a pool of blood --- presently two dead horses --- a successful shell. Passing through Aton the road goes on straight --- ever straight --- kilometre on kilometre. We passed the village and famous battlefield of Ste. Genevieve on our right. Here, on September 8, 1914, two "75" guns, a few mitrailleuses and a handful of five hundred determined French soldiers hurled down an attacking force of 12,000 Germans. Again and again the upright massed line advanced up the hill, to be leveled like bowling pins. After some hours of fighting, the brave little band of Frenchmen on the top of the hill found that they had no more ammunition, so with fixed bayonets they threw the last advancing Germans down the hill. The latter retired to Pont-à-Mousson with some four thousand of their dead left on the hillside. These they disposed of by throwing into the Moselle. The French lost only fourteen men. Apropos of this I am reminded of a possible cause for the illness of many of our boys last June. Half the Section are teetotalers, and the other half drink "Pinard," the vin du pays, which comes from the midi and which is supplied to every French soldier. The water we were suspicious of, so Ned asked Mignot to ascertain where the chef got it. Mignot promised to watch and see whether it really was taken from the spring a little distance from the house, as we had been assured was the case. Imagine our feelings when he announced at breakfast the next morning that the water we had been drinking and which had been used for cooking was drawn from the Moselle! Ici est mort un soldat français No . . . . . .
tombé au Champ d'Honneur, 20 août, 1914." and here a more elaborate cross, a dead commandant, and there a cross marked, "Ici est mort un soldat allemand." We walked on, a silent trio. I was thinking of a year ago, of the wives and families of these heroes already almost forgotten. Now we came to a little village surrounded with trees. On our left, some kilometres away, we saw the "75's " bursting above the Germans. Sitting down with some soldiers who were taking shelter, we watched for an hour these "75's " bursting, foot by foot, along the enemy's trenches. Again we started on our way and passed a hole cut in the road where a German shell had burst not long since. At last we saw Nomeny --- a town of some thirteen hundred inhabitants, placed on the side of a hill and running down to the river Seille, where it ends as abruptly as it starts. Just a charming little town, harmonizing with the surrounding country as only French villages can. We made out the tower of the ninth-century church and the walls of an old ruined castle. The sun blazed on the scene and we stood there looking with true pleasure on this delightful evidence of French genius in combining architecture and scenery. The road curved to the right for some two kilometres. Here Nomeny is hidden from sight. A turn to the left and there again it stands with its old castle. But what an illusion distance had played upon our sight. Ruined castle! Why, the castle walls are the only things that are not ruined. There stands Nomeny's skeleton. Not a roof, not a particle of wood remains! Just the bare walls of the houses. We arrived at the outskirts of the town and presenting ourselves at the commandant's bureau, a lieutenant offered to show us over the town. I cannot describe it. No words could adequately convey the sickening sense of desolation and desecration. Here are the facts. The Fourth and Eighth Bavarian regiments, on August 20, decided to loot the town. Camions coming from Metz took away everything of value. Every house was burned, house by house, men, women and children being shot as they tried to escape. Those who were in the basements of the houses were shot there, or burning petrol poured into the cellars. When the French arrived (our guide was one of the first arrivals), they had to bury sixty murdered civilians. Our long tramp home was uneventful, though very tiring --- except when we came to the little village where we had rested and lunched with the "75's " bursting some kilometres away. Here we found two trees across the road, and on making inquiries learned that the Germans had seen the General's staff car going along the road (did I explain that the whole length of this road is in full view of the enemy?) and seeing the car enter the wood and not emerging on the other side, bombarded the wood, and were successful in wounding the General's chauffeur. Yesterday we went to Fey-en-Haye, and we saw quite another thing. This little village, a bit larger than Montauville, is as completely destroyed as Nomeny. It is true that the church was dynamited by the Germans, but here we have a legitimate excuse. The village was of strategical importance and the absolute destruction was done after the evacuation of the civilians. The ruins look as different from those of Nomeny as could be imagined. 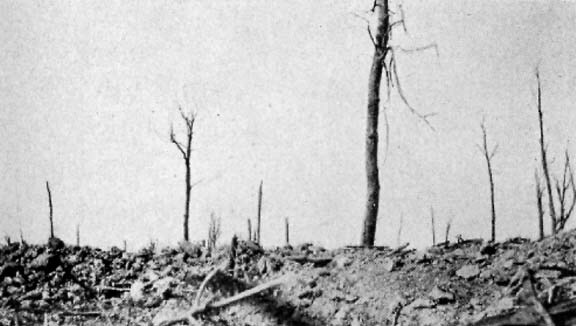 No skeleton remains; it simply has been destroyed by shell fire, hundreds and hundreds of shells, both French and German. The whole place looks as if some great eruption had occurred and leveled it to the ground. Whether it was necessary or not, I don't know, but here one gets the feeling of war and shell, while at Nomeny it is --- different. Last Monday, we heard the news of the English and French victory in the Champagne. 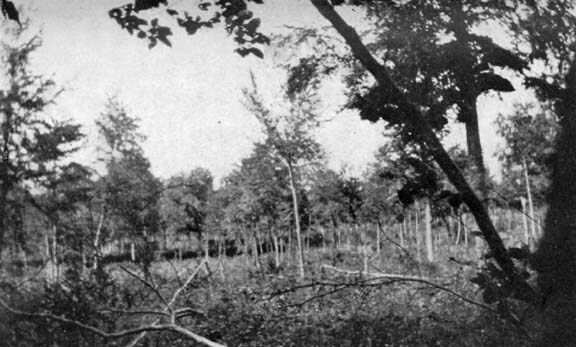 The shelling of the French trenches in the Bois-le-Prêtre had been awful all day, but when the good news spread it sent courage to all the depressed, so that within a short time, the woods rang with cheers and shouts of "A la bayonette!" To-day, lots of nice letters came from America. The last two days have been full of excitement and we have been given an additional secteur to evacuate; consequently our Section has been temporarily divided in two. "Mac" and I remain in Pont-à-Mousson. An attack is expected daily and with it will come the usual heavy bombardment of Pont-à-Mousson and the main roads. At present the rain has stopped everything and the French and English successes will, I suppose, be checked, as the heavy rain will make advances almost impossible. News came this morning that 40,000 prisoners had been taken by the Allies and that three army corps had passed through the lines at Champagne. It all seems too good to be true, the first great good news the brave French have had for twelve months. Rain, rain, rain, all day long; therefore, I do not expect we shall have immediate trouble here. The winter has come --- the cold weather is very bad and a night call is an unpleasant business. The other evening when returning with an empty car, I asked a sentry whom I knew at Dieulouard (from which point onward we are allowed no light) if there was much traffic ahead. "Oh, no," he answered, "not much --- it is mostly past now." So with a "good-night" I started ahead --- and six feet farther on I ran straight into a horse! To-day I saw one of the most exciting episodes I have seen since I came out here. Several German aviatics and French planes had been flying over the trenches and so many shots were fired by both German and French guns that there were at least a hundred white puffs of smoke against the sky. About a half an hour after, three or four shells were thrown into the town and I went up to the top floor of our house to watch them explode. A German aeroplane could be seen on our lines reconnoitering, when suddenly another plane, a Nieuport, came tearing down upon it. We gave a shout, "A Frenchman! A fight! Vive la France!" The Frenchman was now above the German, the German in full retreat. Lower and lower dropped the Frenchman, always overtaking the German. Bang! bang! bang! went the mitrailleuses. The German swerved---the Frenchman was level --- now he was underneath! Bang! bang! bang! A yell went up from us all. The German was hit. His plane swerved, right side, left side, dipped, curved, dipped, nose to the ground, a puff of smoke --- something had exploded in the machine; it was now dropping straight to the earth --- and finally was lost to sight in the woods of Puvenelle. We yelled, we shrieked, we cheered, --- the Frenchman had won! A dull roar came from the woods of Bois-le-Prêtre, thousands of French voices cheering the success of their comrade. You may imagine the excitement at dinner when George Roeder and Willis, who had not been with us, marched into the room triumphant, with bits of the German aeroplane. Yesterday was a serious day for us and I had a bit of an escape. You will have seen, I expect, that we were badly bombarded and that incendiary shells were thrown into the town. It was a Sunday --- it is always a Sunday. "Gott mit uns," I suppose! Well, about ten o'clock I started off to pay a visit to a "wireless" friend with whom I had been learning to read. An aeroplane flew overhead and I pronounced it to be a Frenchman. I was in the middle of the road when I heard the whistle of a shell a long way off, but, strange to say, over my head. It came nearer and nearer, louder and louder. Have you ever actually experienced that inability to move which sometimes comes in a dream? I did then, for the first (and I hope for the only) time in my life. Louder and louder shrieked the shell and I just stood in the middle of the street paralyzed. I could not move. At last --- bang! And then I ran, ran like a bolted rabbit. Of course, it was ludicrously late, but luckily for me the aeroplane bomb, for such it was, dropped twenty metres from me, on the other side of a stone wall. I need scarcely say I was ragged for my inability to distinguish a Frenchman from a German, but it is not so easy as one would imagine. After lunch, Ben and I went to pay a visit to some of our friends in the trenches and afterwards walked through the first line for some time. About three o'clock, we heard a heavy bombardment, the shells passing over our heads in the direction of the town. We walked to the edge of the hill and sitting down watched the poor little place being shelled for two hours. The explosions of the German shells and the shrieking of the French ones as they flew overhead to silence the German batteries was most impressive. At last, one shell came very near the house where Ben and I lived and was followed shortly after by a second, even nearer. Ben jumped up exclaiming, "Come on. I can't watch that any more; it is too close to our house and I have a new winter uniform there." We returned to our friends' dugouts about six and had an excellent supper in the open with stars and trees as a background and a gramophone to provide music, 600 metres from the Germans. The other day, we took another walk through the woods further back from those I have been talking about, where the Germans were last September. Shellholes everywhere, and old trenches marked the battle lines. Violets had already appeared and I picked a few and put them in my fatigue-cap. Passing along a little wood-path, we came upon the inevitable harvest, --- two wooden crosses, side by side --- but different! --- One cross was more carefully hewn, and nailed to it by a bullet was a little piece of red cloth, the color of the trousers the French infantry wore at the beginning of the war, and which is said to have cost France several hundred thousand men. The other cross was just two sticks, and hanging on it was a piece of gray-blue, --- a German. So here, side by side, a long, long way from town or village, in the silence of the wood, lie two nameless soldiers. Foes? I wonder. So the days pass ----Now, with the evening, comes, as often, a grateful time of stillness. I like to watch from my window the shadows lengthen as the sun leaves to them their part. A little later, when they have wholly obscured all detail, man will perhaps furtively begin some move to make the night unlovely --- but for the moment there is rest. An owl has just hooted --- a musty old clock has just struck six --- a convoy wagon rumbling along the road raises a cloud of golden dust --- then silence again. Lately I have discovered a beautiful garden full of fruit and flowers where an old man still stays as caretaker. Schroeder and I go there often and eat the fruit which is spoiling on the trees. Sometimes --- when the day's work is done --- and there is a quiet hour here, it is good to think of other gardens far away where the salt air comes in from the sea --- or often the fog, on these still summer evenings. I can understand now the lure of peace --- and so I am doubly grateful that those of you for whom I care most have chosen to work --- rather than to forget the struggle here. When I come back to you some day, we shall feel a greater peace and sympathy for knowing that with the same eagerness, if in different ways, we have tried to serve and to save those men whose heroism makes our best effort seem a very small thing. NAMES AND ADDRESSES OF THE MEN IN THE FIELD SERVICE OF THE AMERICAN AMBULANCE IN AUGUST, 1915. All, Frederick Hunter Allendale, S.C.
Andrew, A. Piatt Gloucester, Mass. Avard, Percy L New York City. Balbiani, Roger M. L Cuba. Balsley, H. Clyde San Antonio, Tex. Barclay, Leif Norman New York City. Bate, Frederick B Chicago, Ill.
Breese, Robert P New York City. Brenner, Michael New York City. Brewer, Leighton New York City. Budd, Otto William San Antonio, Tex. Burleigh, Robert O Hudson, Mass. Caldwell, Victor B Omaha, Neb. Campbell, Joshua G. B New York City. Carey, Arthur G Cambridge, Mass. Childs, James Rives Lynchburg, Va.
Codman, Charles R Boston, Mass. Colton, Samuel, Jr Worcester, Mass. Cunningham, John Earl Boston, Mass. Curley, Edmund J New York City. Davis, Mahlon W Brookline, Mass. Davison, Frederick T New York City. Dawson, Benjamin F Philadelphia, Pa.
Delabarre, Laurence H Boston, Mass. Diuguid, B. Garnett Lynchburg, Va.
Doty, Ralph Z New York City. Douglass, David B West Newton, Mass. Doyle, Luke C Worcester, Mass. Emerson, William K New York City. Ewell, Andrew T Cambridge, Md. Fay, Samuel P Boston, Mass. Ferguson, Danforth B New York City. Ferguson, Fearchar Jan New York City. Fleurot, Georges G New York City. Freeborn, Georges F San Francisco, Cal. Freeborn, Charles J San Francisco, Cal. Garver, Milton Stahl New Haven, Conn.
Gile, Harold H Colorado Springs, Col.
Girdwood, Kenneth West Orange, N.J.
Hale, Herbert D New York City. Hall, Melville R Ann Arbor, Mich.
Hamilton, Thomas L Nyack, N.Y.
Haney, Paul S Quakertown, Pa.
Hardon, Henry Knox New York City. Harle, James W New York City. Hayden, Edward E Watertown, Mass. Hellier, Walter H Boston, Mass. Henderson, Alexander I New York. Hill, Dudley L Peekskill, N.Y.
Hill, Lovering New York City. Hobbs, Henry Homer New York City. Holt, Carlyle II Hingham, Mass. Hulbert, J. Cowan St. Louis, Mo. Jennings, Allan R Philadelphia, Pa.
Johnson, C. Chouteau St. Louis, Mo. Kent, Peter L New York City. Kingsland, Arthur. New York City. Kingsland, Harold L. New York City. Lockwood, Preston St. Louis, Mo. Lyman, James Otis- Bellport, N.Y.
Lyon, John.. New York City. Maclay, Robert New York City. Martin, William T Burlington, N.J.
McClary, George B Oak Park, Ill.
McConnell, James R Carthage, N.C.
McFadden, John H., Jr Philadelphia, Pa.
McGrew, Dallas D. L Boston, Mass. Melcher, John New York City. Mellen, Joseph M Garden City, N.Y.
Montgomery, Rodman B New York City. Nalle, Albert Bryn Mawr, Pa.
Nightingale, Henry O Detroit, Mich.
Osborn, Earl D New York City. Reese, George F Ravenna, O. Rice, Durant New York City. Rockwell, J. George Bradbury, Conn.
Roeder, George H New Brunswick, NJ. Ryan, Dolp F New York City. Sayer, J. Sears R New York City. Schroeder, Bernard M. P Paris. Sibley, Hiram South Bend, Ind. Smith, Thomas J Chicago, Ill.
Stebbins, Roland W Williamstown, Mass. Suckley, Henry M Rhinebeck, N.Y.
Taylor, John C New York City. Taylor, J. B New York City. Tefft, Lionel Victor Peoria, Ill.
Townsend, Edward D New York. Townsend, Herbert P New York. Walden, Donald M Brooklyn, N.Y.
White, Victor G New York City. Willis, Harold B Boston, Mass. Winant, Frederick J New York City.